I'm working on some Mandala Window Decals and Mandala Suncatchers to take to the upcoming PDX Etsy Summer Sale on Saturday, June 9. I love the way they look all spread out on my table like this! Next I will be cutting them all into circles and putting them in individual packages with a label stapled to the top. Fun for me! I love all three of my part-time jobs, but I am probably having the most fun at Whitman Elementary where I teach art and ceramics two days a week. My art class is currently working on - you guessed it! 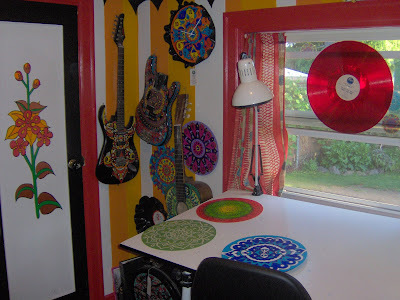 - mandalas on recycled vinyl records. While the kids are working on their creations, I get to work on mine too! 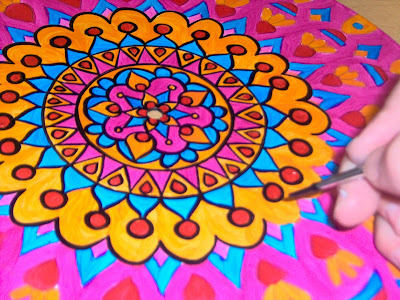 This is my latest mandala. I am really happy with the bright, springy colors. 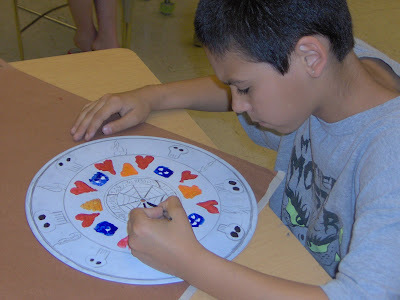 Here's one of my fourth grade students - his mandala is totally rad, with skulls, hearts, dice, and flames! 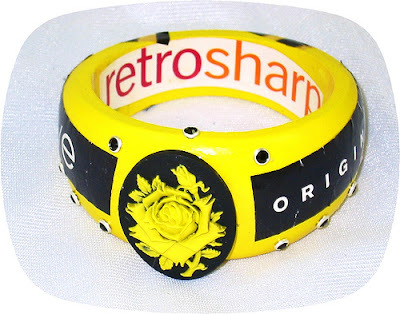 This "Yellow Rose" bangle was made by Ari Designs - that's AriDznz on Etsy. Ari was cool enough to publish an interview with me on her blog today! Check it out at aridesigns.blogspot.com. 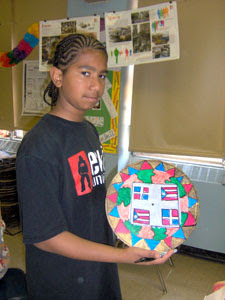 The first class of seventh graders at Henry Street School in NYC created their mandala and painted it with warm colors. There was a large piece of canvas taped down to the floor at the back of the classroom. 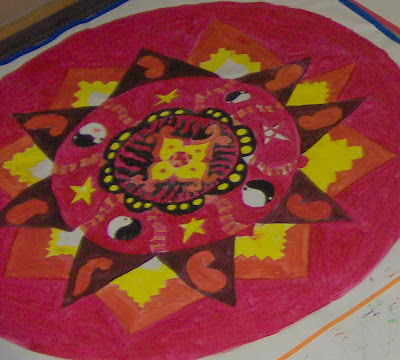 I had about six kids at a time come back and work for 10 minutes on drawing the mandala, then continued rotating small groups until everyone had a chance to add an element to the design. 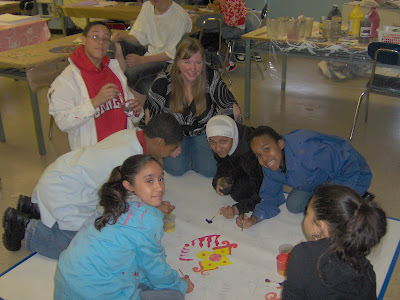 Then each group rotated through again and got about 15 minutes to paint. The whole project took an hour and a half. 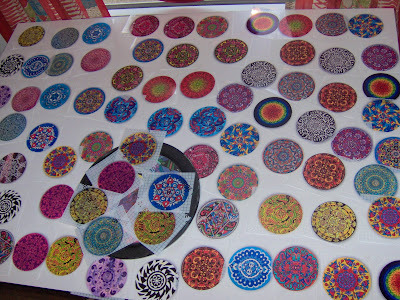 Unfortunately there wasn't enough time to totally finish any of the mandalas, which I knew would be the case before hand. I am still hoping that Terri, the excellent art teacher, will send me some photos of the final products! 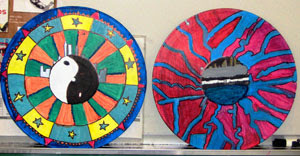 I finished painting these three records last night. Today, they will be transformed into fabulous record bowls for the wholesale order I am shipping to Portage Bay Goods in Seattle's Fremont District. 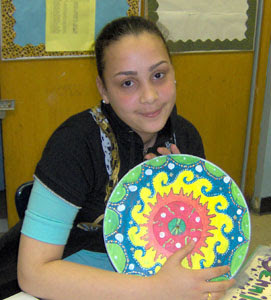 So, the whole reason why I was in New York from April 29 - May 2 was because I was hired to lead three mandala workshops with seventh graders at the Henry Street School for International Studies. On Monday morning, April 30, I took the subway from my friend Joan's pad in Brooklyn into Manhattan's lower east side, off to work in the Big Apple! 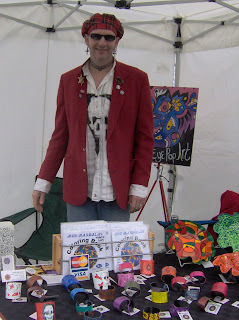 Here's my stylin' husband, Mr. Chuck Thrust, at my booth at the 8th Annual Alberta Art Hop on Saturday. Chuck made three trips up to Alberta that day - to help me set up, to bring me some clamps that I had forgotten (and desperately needed to hold my booth together in the wind! ), and again to help me tear down. And while I was chillin' at the hop all day, Chuck also went to a baby shower, took Julius to get his glasses fixed, and took the kids over to spend the night with my parents so we could get burgers and play chess at Mickey Finn's. 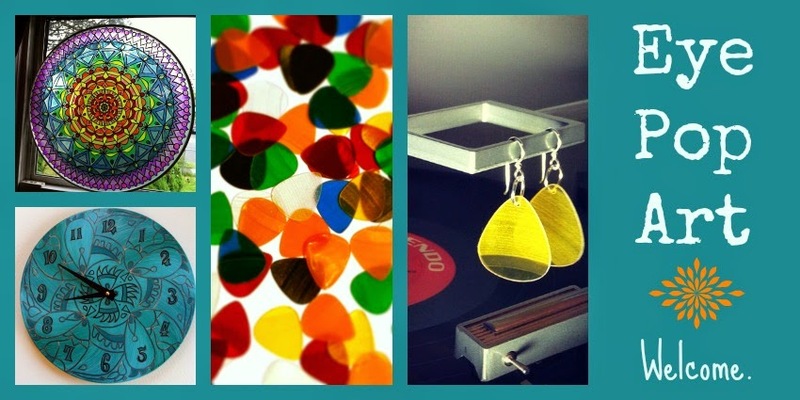 Check out Simple Sal on Etsy! 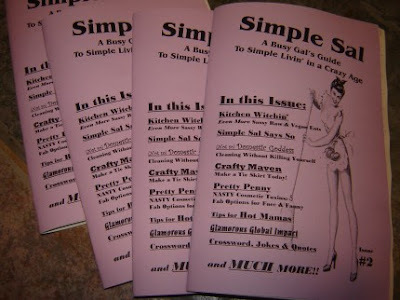 Her zine is great - funny, cool, intelligent. Full of recipes, hairdos, craft projects, and a great crossword puzzle featuring "Mostly 80s, Mostly Cheesy" song lyrics. The "Glamorous Global Impact" section is right on. Check me out on DIY Alert! The fabulous Sister Diane has been kind enough to interview me for the "PDX Profile" on the DIY Alert! blog. She also wrote about me on her blog, CraftyPod. 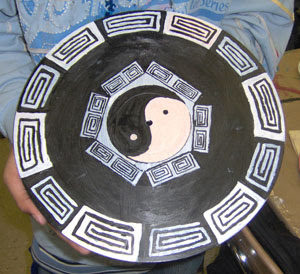 Please CLICK HERE to read the interview and learn more about me, my mandalas, and how I got started with using recycled materials in my artwork. I took over 400 photos during the 4 days I was in New York at the beginning of this month. I plan on interspersing them throughout my groovy new blog. 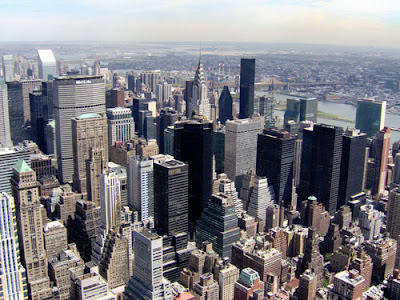 So here's the view from the Observation Deck of the Empire State Building - at such a dizzying height! Here's my first blog post! Hi! 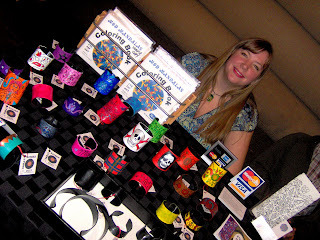 This is the most recent picture I have of me, Christine, at my table at Crafty Wonderland on May 13, 2007. I love this event. It's held down in the lounge at the Doug Fir, so it is dark. They played great music all day. I also noticed there were a lot of babies there! Was it because it was Mother's Day? So many cute babies...and I don't think I heard any of them cry! Couldn't find the guitar case picture, but look at this old snapshot from 1998! And so it begins...this is exactly what I want my blog to be like...a mix of the old and the new. 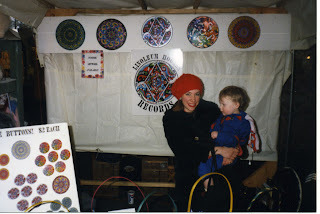 This blog will go back and forth in time pretty often as I pull together all the history and "residue" (as we used to say) of this colorful, vibrant, crazy, artistic life I have been blessed with. Enjoy! P.S. Someone comment and ask me what "hogass" means!